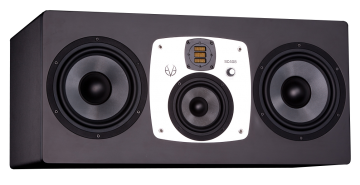 EVE Audio SC408 - 4 Way 8" Monitor > Eve-Audio > Diffusion Audio Inc. The SC408 is the largest four-way system monitor that EVE Audio produces and the perfect choice for larger control rooms where engineers look for the correct combination of power and precision. A pair of 8" SilverCone woofers with its glass fibre coated diaphragm in honeycomb structure and low distortion copper cap magnet systemcover the frequency range from an earthshattering 32 Hz up to 250 Hz. This will guarantee you a powerful, accurate and tight bass reproduction. A sophisticated 1.5" voice coil is responsible for creating a greater linear excursion, which will give you a very clear and accurate bass. A 5" midrange unit, specially developed for SC408 uses our very low distortion copper cap magnet system and completes the system together with the Air Motion Transformer RS3 (AMT Ribbon System 3). The AMT RS3 – the same as in the SC407 model – houses a bigger magnet system to deliver a higher output level with virtually less distortion. Each driver is provided with its own PWM amplifier for a total short-term output power of 800 W. With a maximum output level of 118dB (SPL @ 1 m), there's plenty of power to keep the air moving, even in the larger control rooms. The SC408 combines a perfectly powerful bass with a transparent mid-range and crystal clear high frequency reproduction. For those reasons, we believe it will be the tool of choice for most mid-size to larger control rooms and studios.